Better get out a box of tissues, because you’re about to cry tears of joy. After a lifetime of begging, 83-year-old Pulitzer Prize–winning author Philip Roth’s dream has finally come true: He got to drive a golf cart. Roth’s semi-autobiographical novels often feature protagonists for whom—despite a strong desire to do so—driving a golf cart remains just out of reach. 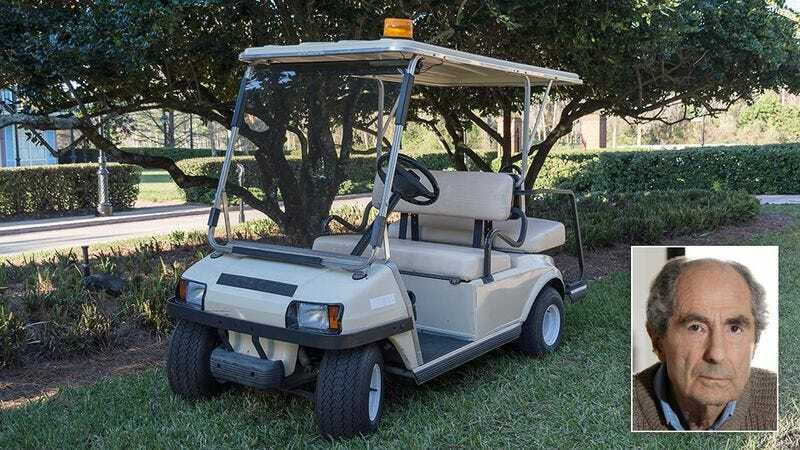 Roth has made it no secret that the golf cart–driving ambitions of Nathan Zuckerman, the protagonist of many of his books, are very much based on his own. On the path in front of me was parked a golf cart with a man seated in it. I thought of how I’d love to strap myself into the cockpit and grip the handlebars, pushing them forward to drive the golf cart onward. Well, after all his years of begging, Philip Roth finally got his wish. Last week, while visiting a friend, Roth noticed a golf cart in the garage and begged to be allowed to drive it. He was overjoyed when his friend said yes, and he took it out for a spin. Although a low battery meant he could only drive the cart about 40 yards before it died, he was finally able to satisfy his lifelong urge. We’re so happy for you, Philip Roth!